Vertical Gallery presents Lost and Found, the debut US solo show from British artist My Dog Sighs. 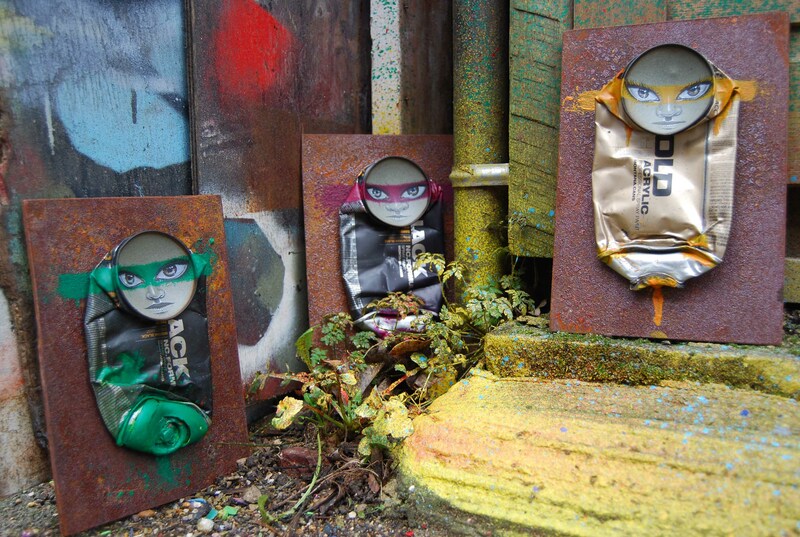 Inspired by the beauty of urban decay, My Dog Sighs upcycles old cans and other objects, and adorns them with beautifully detailed faces. The artist’s work forms a narrative based on counterpointed poignancy that resonate with those that have the opportunity to find them. Moments of loss and then being found echo the materials used. My Dog Sighs’ Lost and Found is September 6 – 27, 2014 with an opening reception with the artist on Saturday, September 6, 6-10PM. Painting on recycled materials is a signature of My Dog Sighs’ work, most recognizable are food, drink and spray cans, which are twisted, crushed and hand painted. Each has its own character, be it melancholic clown or aggressive punk. After working quietly but fervently on the streets for the last ten years, honing his craft, My Dog Sighs has this year finally found himself strapped in to a well-deserved meteoric rise. With an incredible international following in Israel, Japan and the UK, a number of sold out shows under his belt, and a strong following of staunchly loyal fans on social media; My Dog Sighs is fast becoming an important figure on the contemporary art scene. Coining the term and the concept of Free Art Friday, he has driven new systems of artistic interaction, pushing purist ends through inclusive means. Systematically putting free art out on the street every Friday for over a decade, the innocence and passion of this urban treasure hunt have made him a cult figure. Restlessly opening new windows into humanity through his painting itself, his community projects and the poetry of an accidental find, he continues to change the fabric of the world – one tiny glance at a time. This entry was posted in Openings and Events and tagged My Dog Sighs, Vertical Gallery. Bookmark the permalink.